Jim's Notebook: Open to Gossip Girl, The Walking Dead and More! 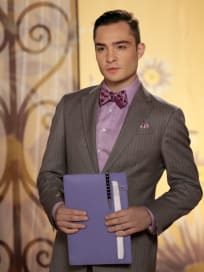 GOSSIP GIRL During my chat earlier this week with showrunner Sara Goodman, I asked if having the final season only consist of 10 episodes was a luxury in terms of storytelling... or quite the opposite because they have a lot to wrap up with our favorite Upper East Siders. How long will Georgina Sparks be around? Will it be Dair or Chair in the end? Will everyone be romantically paired up by the end? Goodman and I talked about all that and much more so keep an eye out for the rest of the interview coming Monday on TV Fanatic. THE WALKING DEAD When we start the new season of AMC’s zombie-tastic adventure - on October 14! - some time has passed since we last saw Team Rick depart Herschel’s farm and seek a new safe haven - and the first few episodes take place at an abandoned prison... well, abandoned of any humans! 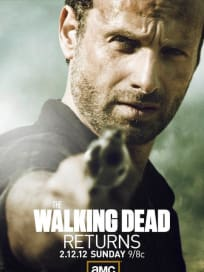 But we also have the tense relationship between Andrew Lincoln’s Rick and Sarah Wayne Callies’ Lori and the two actors talked about it at the show’s press junket yesterday in Beverly Hills. The rest of my Walking Dead coverage – including a chat with the new big bad of the season played by David Morrisey – will be posted early next week on TV Fanatic. THE SIMPSONS Moving from zombie thrillers to animated ones, The Simpsons’ ‘Treehouse of Terror XXIII’ airs this Sunday and Executive Producer Al Jean told me when I sat down with him recently, “I’m thrilled that it airs in October” since Fox has often aired the holiday episode post-Halloween. Then, in another Simpsons tradition of paying homage to a classic film, the show does so with one that helped make Michael J. Fox an international superstar. PARENTHOOD The Jason Katims series has never shied away from a weighty subject, but when it was revealed that Monica Potter’s Kristina has breast cancer, an even heavier-than-usual dose of reality burst onto the show’s canvas for the first half of the new season. On a press call earlier this week, Katims said that he knew that not only could the show do the story justice but that also goes for his talented cast. Katims also revealed what was said during his first conversation with Potter; “She said, ‘I want to find the humor in the situation too. We don't want to get to a place where I'm crying all the time and that's all I'm doing.’"
CHICAGO FIRE The new NBC firefighter drama kicks off next Wednesday, so expect to see lots of heated fires to be put out both on the job and in some of the relationships between the show’s characters. On a press call earlier this week, Jesse Spencer - who plays Lt. Matthew Casey alongside actors Taylor Kinney, Monica Raymund, David Eigenberg and Eamonn Walker - explained how the personal and professional lives would coexist on the series. Spencer added that there is also a family component to the characters on the show, which isn’t just a construct for the series but taken from the reality of firefighters.